« Spotted in Atlanta by my sister. Here’s a bit of truth. I have quite a lot of biblical knowledge. You can’t be a PK and easily avoid it. So yeah, I’m studied up. I might even know what an exegesis is. And because I know the Bible pretty well, I am better than you. HAH! The look on your face. No, because I know it pretty well, I know it gives high regard to two specific groups … widows and orphans. ORPHANS! Orphans deserve every good thing we can give them, and two people who recognized this happen to be Pittsburgh Penguins. 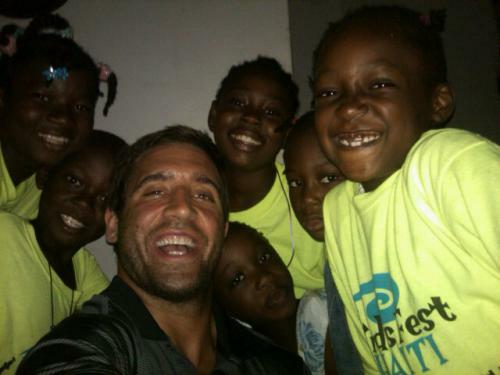 The chaplain for the Penguins operates an orphanage in Haiti and Mike Rupp and Max Talbot went for a visit last weekend to shower the orphans with gifts and perhaps more importantly, time. Jamie and Ali McMutrie have been known to say to me, “When are you coming to visit?” and I am all, “EEEEEEEEEEK.” It’s still a heartbreaking place, and I’m not sure my heart can take it. This is why people who have hearts strong enough, have my unending respect. 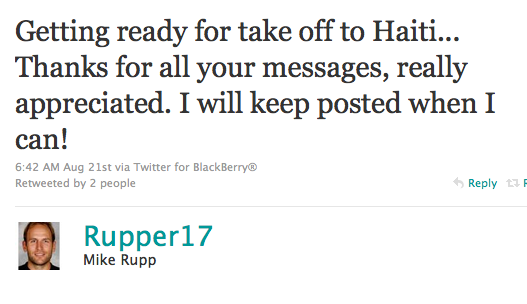 You want to follow Mike Rupp on twitter as he’ll be posting pictures from his trip over the next few days. So this is a story all about how the Pittsburgh Penguins continue to personify grace, class, and selflessness off the ice. Ahem. Huge bonus: he’s super cute. Shhh… don’t tell the Mr.
Gotta give credit where it’s due: That team does PR (and humanity) right. My love for Max Talbot continues unabated. Ginger, totally off the subject but since I’m not on Twitter I decided to post here. Anyway, not to rain on your ranch powder parade, but that stuff is full of MSG and you need to stop eating it. I say this as your older, wiser sister so you have to listen to me. Woman! Must you ruin every good thing in my food life?! I threw it away. As you wish. Thank you for posting this! So proud of our Pens on so many levels…. Max says Sean Casey was in Haiti, too – if it’s the former baseball player Sean Casey (Upper St Clair grad), you could make it an Awesome Burgher hat trick! I love that man. Always have, always will. I buy MSG, and apply it, heavily, on popcorn!